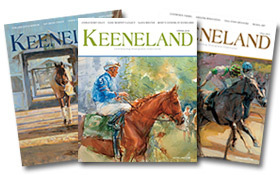 Need help with your Keeneland Magazine subscription? We can assist you with changes of address, missing issues, and renewing a current subscription. Just tell us about it below and we'll be in touch by the end of the next business day. Or, call customer service at 1-800-866-2361 ext 6748 or 859-276-6748.